A Little Bit etc. 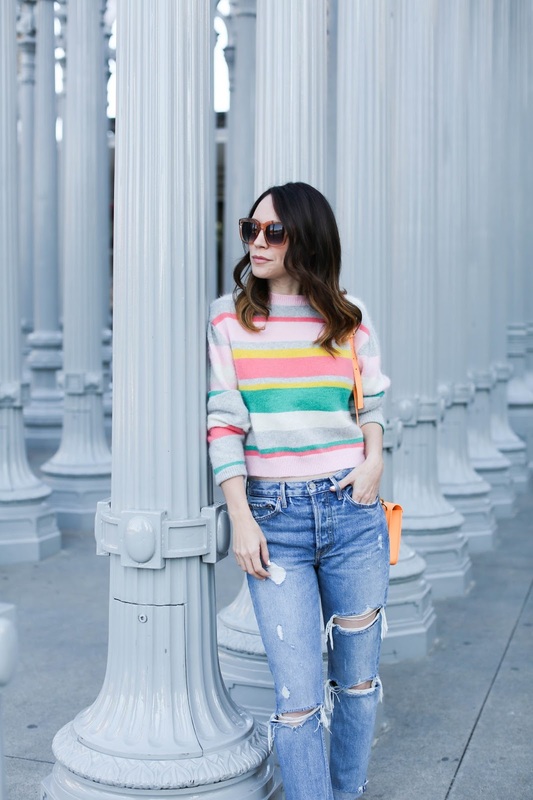 : Sunny Days in L.A. This sunshine! You can tell from my cheesy grin in the last few photos that I am clearly a warm weather person. 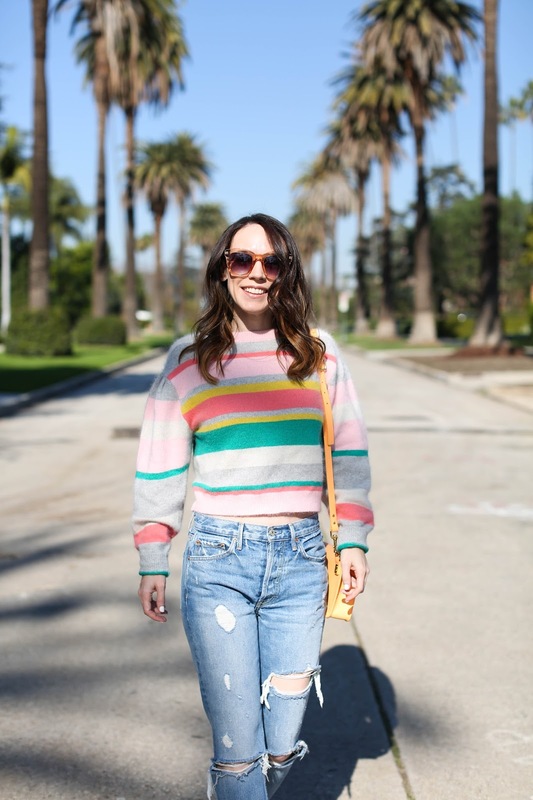 These pictures are from our trip to Los Angeles a few weeks ago, and while the city has been experiencing some epic rainfall recently, we had nothing but blue skies during our time there. I know it is probably a tad cliche, but I automatically wanted to wear anything in my closet that was colorful and bright. 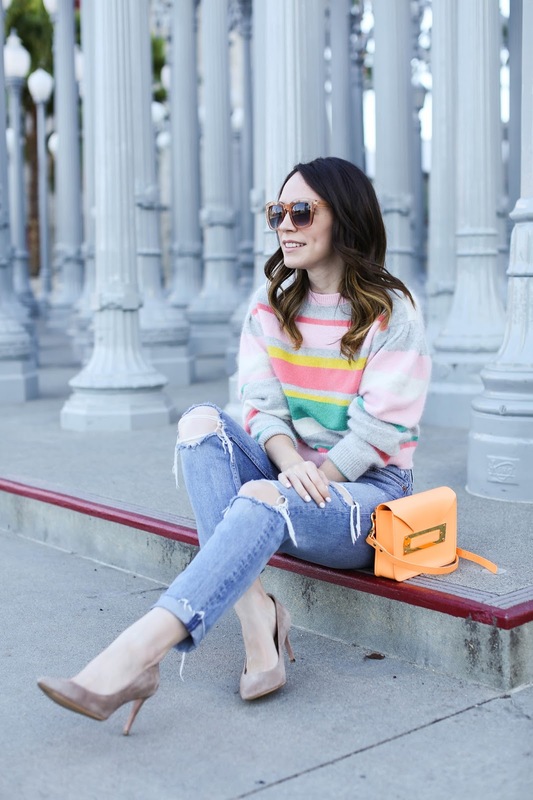 I saw a ton of people wearing black in L.A., but I used my trip as a time to tap into my inner Rainbow Brite. Ha! The first morning after we arrived, we drove over to LACMA and saw the (heavily Instagrammed) columns and couldn't resist taking a few pictures. We had plans later that afternoon to visit one of my dearest friends and her family, but before we headed over I made Stan pull the car over on a street because it looked so quintessential Hollywood to me. In fact, the exact street that we took these pictures on has a direct view of the Hollywood sign at the very end. It was sadly too far off to capture in these photos, but the homes and landscape of the entire area was beautiful. I forgot to write the exact name of the street down, but if my memory serves me correctly it was Wyndam St in the Hancock Park neighborhood. Later this week, I will be putting up my travel diary from our time in Los Angeles with all the places we visited and restaurants we enjoyed so stay tuned! Hey there Gail! I went ahead and googled the bag you were referring to on Fashionphile's site and I am being completely honest - I am not 100% sold on it. While it seems like a somewhat current style, it sadly doesn't look that way. There are some bags that even after many years, still look current. But for some reason, something about this bag seems dated to me. Also, the interior is not my favorite. The striped multi-colored lining seems a tad odd. I don't remember too many of my Gucci's bags having such colorful linings. Anyways, I am so sorry to be a Debbie Downer on your possible bag purchase, but you know I do like to give my honest opinion so as not to just blindly tell people I love everything when I really don't. However, investing in a bag is a major personal decision, and I like to encourage people to truly buy it if they love it. Regardless of anyone else's opinions. So while I gave you mine, if you can't stop thinking about it and can see yourself carrying it - then I would buy it. Because there is nothing more current than a woman that feels fierce and fabulous with what she has on! Hugs!! I asked because I do appreciate your honesty, it doesn't hurt my feelings. I was on the fence about it so I will pass. Have you seen the new Chanel spring summer bags. Oh my!!! This year is my. 60th birthday and our 30th anniversary if I could I convince my hubby this would be a great present the top handle flap is my favorite. Thank you again.